Only 14% of people keep their New Years resolutions for a year. How do you stick with the promises you’ve made? This is a bit of a “closing the stable door after the horses have bolted” kind of statement, but part of the problem (as I see it), is that people make up BIG resolutions that they’d like to do, but deep inside they know they’re not going to… They just feel the making of the resolution will create the motivation they need to succeed. Sadly just making up your mind isn’t strong enough in many cases. 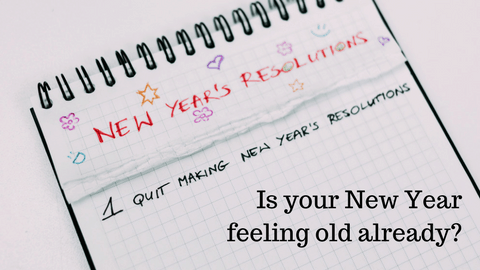 They also say that people in their twenties and more than twice as likely to keep their resolutions than those over 50! Surely us oldies should have learnt by now! I’m no longer in my twenties so statistically it’s harder for me to keep my resolutions, and, for years I have been saying “I’ll lose weight and eat healthier” with little success. I get very enthusiastic, I might even buy a diet or nutrition book. I’ll shop for healthier food and avoid chocolate and crisps… for a while… And then I have a stressful day, or maybe a long day filming and I’ll crave chocolate… So I’ll give myself a little “treat” to make me feel a little better… And then I’ll have a bit more, and I know it 3 or 4 days have gone by and I’ve forgotten my health kick. I know I can’t do it by myself. On my own I give up too easily, I’m weak and lazy and go for the “easiest” option which isn’t necessarily the “best” or “healthiest” option, or the goal I really, really, really wanted to succeed in. This time I’m doing it differently, I AM going to eat more healthier. And to guarantee I succeed I’m getting the support of a nutritionist. She’s going to be checking my food diary and will be tough with me if I slip up. So that way, if have some chocolate I have to write it down and justify why I had that sugary “treat” in our weekly calls, which between you and me are not that comfortable. So when that urge hits me I have that added thought “do I want to have a difficult conversation… is it really worth it?” Sometime it is worth it, often it is not. That means I am eating less unhealthy food and am more likely to succeed in you goal. I meet lots of people who are keen and enthusiastic about growing a YouTube channel with lots of videos. They come on one of my workshops, or sign up for my online course, or even have 1-2-1 coaching and they learn how to shoot video blogs, or info videos, or video testimonials. They tell me about their amazing plans to shoot 20 videos, grow their YouTube channel and get a mass of traffic flowing to their website. Do they do that? Well some do, sadly most don’t. That’s why I have coaching programmes that support you in your video production. When you decide how many videos you want to make you get me on your back supporting (nagging) you to finish them, and helping you when you get stuck. After all, your success is my success. Want me in your corner?